Transportation on Aruba is something you will need to find, unless you plan on staying at your resort your entire vacation. Your feet will get you just so far. We love to walk along the beaches and along the beach walkway to many of the restaurants, shops, and casinos in close proximity to our resort. We take the bus when we want to go into the town of Oranjestad, or if we need to go to the supermarket to shop for snacks and beverages. We find this to be a very safe and convenient mode of transportation on Aruba. If you want to venture out on your own and do some sightseeing than you definitely need transportation on Aruba. Aruba car rental companies are easy to reach. You can rent a car at the airport or from your hotel. The island has some rugged terrain, especially on the north east coast; so a car will not be good for certain sightseeing areas. You will need a 4 wheel drive vehicle. I don’t think a car is going to cut it. There are also many tours you can take without having to rent a jeep. If you are leaving your hotel to go to dinner at a restaurant that is not within walking distance, you may ask the doorman to get you a taxi, if you did not rent a car. The roads are pretty flat in the hotel area and in the town of Oranjestad, so there should be no problem riding a bicycle, motorcycle or scooter. Limos are also available if you feel the need for one. 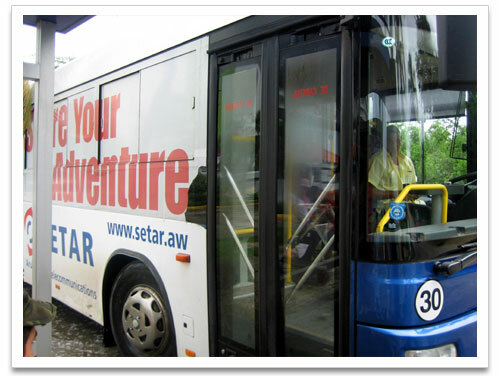 We find the bus service on the island to be safe, convenient and inexpensive. Public buses run along the hotel strip from the main bus station in downtown Oranjestad. There are bus stops outside most hotels along the high rise Palm Beach hotel strip. 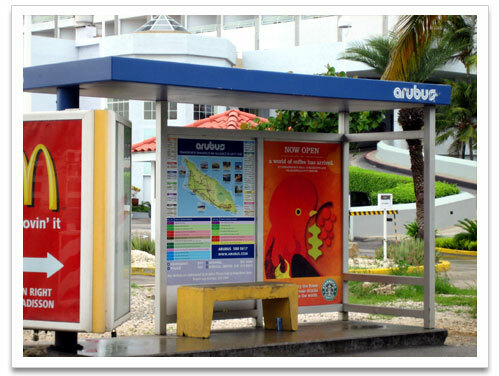 From the hotels to the town (Oranjestad) and back, the buses usually run 7 days weekly. On Monday to Saturday they run about every 15- 20 minutes from 6am to 6pm. Between 6pm and 12mn they run less frequent. We find that on Sunday and holidays they run about every half hour. Ask for the bus schedule at the front desk of your hotel. The cost per person for a one way ticket is $2.30. Try to have exact change when taking the public bus. If you decide to take a minivan, just remember that they are independently owned. 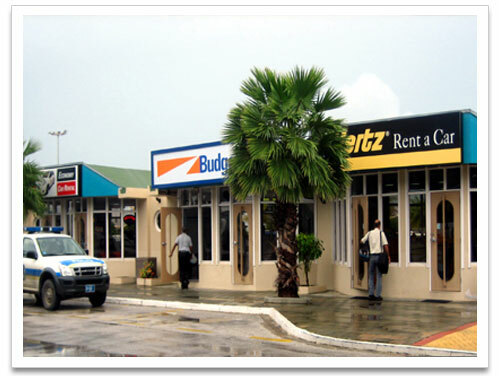 There are many Aruba car rental companies from which you can rent an automobile. At the airport there are several for you to choose from. 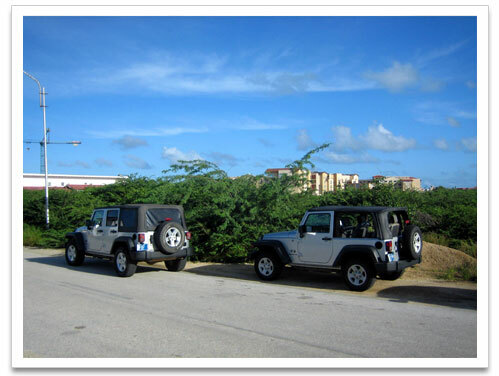 You can also rent a car through many of the resorts for your transportation on Aruba. Each company has their own requirements. Most rental companies want you to have a valid driver’s license for at least two years. A deposit of $500 usually is stipulated and there are age requirements. The minimum age to rent a car from some agencies is 21, while other rental companies require you to be 25 years old. Some companies have a maximum age and will not rent to anyone 65 and over, while another company’s cut off age is 70. Most offer unlimited mileage. It’s also important for you to have insurance. There are special discounts for timeshare members as well as for those who have a VisitAruba Plus discount card. Shop around and read the fine print. While on the island of Aruba you must drive on the right hand side of the road. Get familiar with the signs and the rules of the road. Be careful and pay attention to the roads. On this island the local people are very courteous and will stop at any moment to allow pedestrians to cross the street. It’s kind of nice...people allowing other people to get ahead of them! Almost unimaginable in some cities of the world. On the island of Aruba you cannot stand on the road and hail a taxi. If you need a taxi for transportation on Aruba, the front desk or the doorman in most resorts will be able to get you a taxi very quickly. Usually, in the evening there are taxies waiting out front of each hotel and near the restaurants. Most restaurants will call for a taxi for you if you ask. The taxi will not have a meter because fares are set by the Dept. of Public Traffic. Rates are based on destination not mileage. The taxi fare rates are per trip NOT per person. A taxi can only take a maximum of 5 people per trip. If you would like to rent a Limo for your transportation on Aruba you can call Super Limousine Aruba. The front desk at your hotel will be happy to help you with the arrangements. Since the weather in Aruba is so wonderful, many visitors want to explore the island by riding in the fresh air on a motorcycle, ATV, Jeep, scooter or bicycle. Your choices for transportation on Aruba come in many forms. Many of the resorts have bicycles for rent. If you wish to ride a Harley, your wish can be granted in Aruba. You need to have a valid driver’s license. Helmets will be supplied. As you can see you have many choices for transportation on Aruba. Check out information on air travel to Aruba.